It seems that, when you pick from the list of apps that look to solve serious pain points, email clients are the ones that nobody can quite seem to get right. 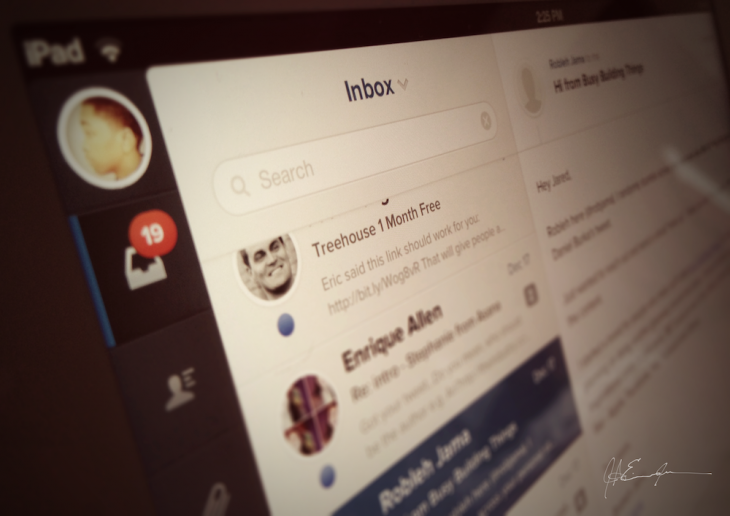 For those of us who prefer to do email on the iPad, however, there are loads of options. The latest of these comes from some names that you might know, and it’s dubbed Evomail. Evomail’s approach is similar in function to others, but the UI and UX elements have made it stand out a bit in a somewhat-crowded space. At the moment, it’s Gmail only, but we’re told that other options will be coming later. We first mentioned Evomail back in January, and noted that the startup is beginning its focus with the iPad. That focus, and a killer team, have both paid off in a client that’s slick, fast, well-designed and wonderfully easy to use. Designed by Jared Erondu, Evomail is built by Jonathan George of Boxcar fame and iOS consultant David McGraw, whose perhaps better known as the name behind game development house iGotIt. Designer Dominic Flask (aka DangerDom) has also recently joined the team, and we’ll perhaps see his influence down the road. When you load up Evomail, you’ll get a guided tour of the different areas, and what they do. Fortunately the majority of the icons stay true to what you’ve seen in the past, so there are very few surprises. The standard left column gives you an overview of your messages, with the full display on the right. Labels, archive and delete functions are handled by three buttons on the bottom of that right column, and a compose button resides permanently in the bottom left. Tapping on the Folder icon (the three, horizontal lines) takes you to your pre-assigned folders, and a full Gmail search is a welcome addition. What’s perhaps most interesting to me is that the team has chosen to not reinvent the wheel (a la Incredimail or Alto Mail). Instead, they’ve apparently focused on simply building a client that makes sense, has almost zero learning curve and works how you think it should. That last piece, as important as it may be, is one of the most difficult parts of UX to get right. The Evomail team has done so in spades. About the only feature that might surprise you is the ability to share emails. While it doesn’t yet work with HTML-styled messages, plain text ones display just as they do within the client, but on a page that’s accessible via a link, which can be shared through Twitter, SMS or a copied link that you can send out through any text-based service. In the few days that I’ve been testing Evomail, it’s quickly become my service of choice. Since I often work in folders (because my sanity requires it), the built-in mail.app of the iPad isn’t the easiest choice. Mail.app requires more taps, and forces me out of my All Inboxes view in which I choose to work. That’s obviously less than ideal. Evomail is $2.99 and it appears that there will be more features to come. Those folks who signed up for early access were greeted with a message that promised them a free month of push notifications for their interest. The team is quick to point out that this is the first live version, and that there will be bugs. While I didn’t encounter too many in my time testing the app, your mileage may vary, so don’t expect perfection just yet. But there’s simply no better way to find out the bugs in your system than to have actual users put your product to the test, and Evomail shows more than enough promise to make the download worth your while.